"Great salad you can serve on the side of a main dish or add roasted chicken and have as a meal! Chopped Belgian endive and radicchio can be substituted for the baby greens if you prefer a more exotic twist on salad recipes." Whisk the mustard and vinegar together in a small bowl. Drizzle in the olive oil while whisking to create a dressing; set aside. 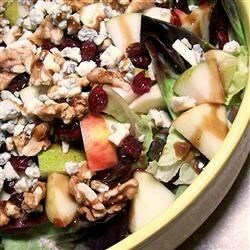 Place the apple, pear, cranberries, baby greens, blue cheese, and walnuts into a large salad bowl. Toss gently to mix, then pour on the dressing, and toss to coat. The taste of the dressing was not what we expected. It was very strong. It over powered the sweet taste of the apples and cranberries. I tweeked this somewhat. I didn't have pears so I omitted them. I didn't have blue cheese so I used feta cheese. It was a big success. I couldn't wait to try your recipe since you said it was great. The dressing tasted very good, but the salad turned wilted before I could get it on the table (less than 3 minutes). This is the perfect salad - I do make this from time to time, although I use a little less mustard and add some sugar or honey to the dressing. One of my favorite salads. LOVE the dressing. I used romaine cause that's what I had on hand, and omitted the apple cause it just didn't need it. The pear was plenty. Skip the mustard dressing and make a simple balsamic and it gets five stars. I've even added sliced steak for a main course. Use Paul Newmans light balsamic in a pinch.